The website is accessible in more than 20 languages, provides miltilanguage support, the widest range of banking options, plenty of casino games to play and 15 years of operation in the industry. These feats are remarkable on their own, but when characteristic to just one online casino, that makes a champion in internet gambling, that is Unibet Casino. Unibet Casino uses 3 software at the same time: The downloadable version with Microgaming games, the flash version for Netent games and the live casino for games developed by Evolution Gaming. The welcome bonus of Unibet Casino, not being big enough is often considered its only shortcoming. This is said because only a tiny €100 is offered for new players, however on the other side the wagering requirements for this bonus are as low as 25 times the bonus amount. So despite of the unusually small bonus it is safe to recommend Unibet Casino even to novice players as the rollover requirements are favourable and a great opportunity to try live casino and the two most popular software on the market at the same time. Unibet Casino also regularly offers free spins promos about which you can learn from the below blog posts. Yesterday we reported about Redbet’s Scarface Slots launch, and now we present to you one more Scarface slot promo. 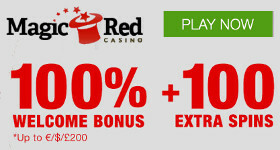 If you like this new 5 reels, 3 rows, 20 bet lines video slot why not play it at Unibet Casino as well and grab the benefits of their promos too? Play for €50 on Scarface by no later than 29th April and get 25 Free Spins on Monday, 30th April. Play for €200 on Scarface by no later than 29th April and get 100 Free Spins on Monday, 30th April. Play for €500 on Scarface by no later than 29th April and get 250 Free Spins on Monday, 30th April. Unibet Casino is also giving you the chance to win a 5 star holiday to Miami, home of legendary Tony “Scarface” Montana. There will be a €15,000 Scarface tournament held between Monday 30th April and Sunday 6th May, where the winner will bank a €10,000 cash prize pool as well as a 5 star trip to Miami, Florida. Play Scarface for free spins now!